Our Oils and Balsamics make it easy for you to just break out a loaf of good bread or pour pasta out of the pot and into a serving dish! Combine or dip with these pairings below. With notes of crushed garlic, sundried tomatoes, and rosemary, the Tuscan Herb Olive Oil is a staff favorite! Mixed with the tart and fresh flavor of the Sicilian Lemon White Balsamic, add this pairing on bow tied pasta and add some romano cheese and tomatoes. It's also the perfect pairing to bring with a loaf of sourdough on a picnic! 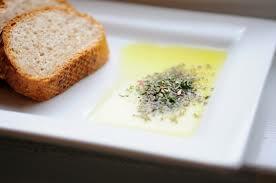 For the purist, who adores olive oil and sticks to the basics! The Koroneiki Olive Oil is robust, aromatic, and fruity. Once paired with our 18-year aged balsamic, the combination is difficult to resist. Don't be afraid to soak sundried tomato foccacia in this--it'll be worth it. Make quick and easy garlic bread when you're crunched for time: split a loaf of sourdough, brush with this olive oil, and add an Italian herb blend along with romano cheese. Bake in the oven for 350 degrees Fahrenheit for 15 minutes or until cheese gets golden.